To start this show Alison does a book review of “Gorilla Food: Living and Eating Organic, Vegan and Raw” by Vancouver vegan restaurant owner Aaron Ash. We will also be discussing how to have a successful vegan wedding with meat eaters. One of our lovely co-hosts was recently married; find out who by listening in. For our first interview, we have Elizabeth Hogan from World Society of the Protection of Animals (WSPA) speaking about the Stop Sea Turtle Farm Campaign. The campaign is to stop the Cayman Turtle Farm which breeds and sells these beautiful endangered species for meat. The turtles living in this factory farm are diseased, distressed and injured. You can watch the video here to see the horrible living condition of these turtles. You can sign the petition to Stop Sea Turtle Farm here. For our feature interview, we are honoured and delighted to welcome back Dr. Will Tuttle. Dr. Will Tuttle, educator, author, and composer, has lectured and performed widely throughout North America and Europe. He is the author of the #1 Amazon best-selling book “The World Peace Diet” and is a recipient of The Peace Abbey’s Courage of Conscience Award. 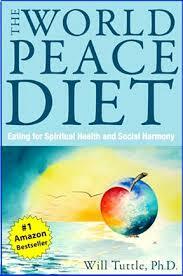 Dr. Tuttle discusses the main ideas in his best-selling book, “The World Peace Diet”, which has been called one of the most important books of the 21st century. It provides the foundation of a new society based on the truth of the interconnectedness of all life. In this interview, Dr. Tuttle makes explicit the invisible connections between our culture, our food, and the source of our broad range of problems — and the way to a positive transformation in our individual and collective lives. Anyone wishing to understand the big picture of our culture and why we have the unyielding dilemmas we face, and how we can solve them, will be fascinated by these provocative, challenging, and ultimately inspiring ideas. He will be speaking in Vancouver this Saturday, August 24th for a free fundraiser event for Earthsave Canada. Find out more here.